The SF Giants over the past two games have proven once again that they will find the strength within themselves and overcome whatever obstacle is put in their way. We were warned that every other team would be “gunning” for us and that certainly proved to be true as I watched my players being picked off one by one due to injuries inflicted by some of the “dirtier games”. Oh yes, I believe that I witnessed opposing teams intentionally causing or attempting to cause injuries to the players on my SF Giants team. I believed they would rise above playing with a virtual skeleton team and I was optimistic about rapid recovery of those taken down. I find the information Alex posted to be good news and remain faithful to the end. A bunch of injury updates today, and the news is mostly good. We’ll start with Santiago Casilla, who began the road trip on two crutches, went down to one and now is walking without a limp. Casilla threw off flat ground today and said he feels really good. He said the hardest part now is the mental aspect, because it’s tough to be on the D.L., but that might change soon. Bochy said Casilla could be two weeks away from returning, which would be a vast improvement on the original diagnosis that Casilla would be out until after the All-Star break. The Giants waited a long time for Angel Pagan and ultimately ended up putting him on the disabled list. 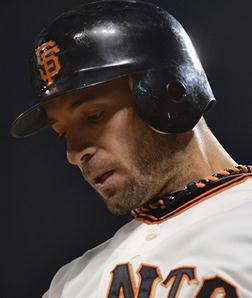 Bochy said a decision with Scutaro will probably be made around the seven- to eight-day mark. For now, “We’ll stay in a holding pattern until we get back (to San Francisco),” Bochy said. Angel Pagan ran sprints this afternoon and is taking BP as I type. He also is feeling better, but remains unlikely to be activated this weekend. One more on the injury front: Hector Sanchez said his shoulder is now 100 percent after holding him back all spring and early in the season. “It’s all good,” he said. “I’m finally healthy.” Sanchez said that last part with a smile. He said that two days after he came off the Triple-A D.L. when his shoulder was hurting, his thumb got nailed by a pitch. But that has also healed. — Brandon Crawford’s move to No. 5 is a one-day thing, at least for now. Crawford won’t hit fifth tomorrow against a left-hander. As for the guys responsible for turning double plays with Crawford, Tony Abreu will start tomorrow against Mike Minor and Nick Noonan will start Sunday against right-hander Julio Teheran.